5 Bedroom 4 Bath home sleeps 16 - Book 3 nights get 4th free!!! Crystal Lagoon in Very popular Villages of Crystal Beach-2 Living rooms and 2 wet bars! Very Comfortable living! From the time you enter the gates of the Villages of Crystal Beach you will be overwhelmed with the beauty surrounding you. The lavish waterfall at the entrance is where you will start your "Island like" Tropical vacation. The Lagoon pool area take up one block of the Villages with Waterfalls, Rock formation, Tiki gathering area and Hot tub. Surround sound music plays all day for a relaxing atmosphere. At the Tiki area there is a self service bar with a plasma TV. Enjoy also the comfortable covered seating while sipping on your cold beverage. We offer a complimentary trolley service during peak season that will whisk you right away to the beach!! This home has the best location in the Villages. It sits right in the middle of the pool so you can walk right out the door to the entrance of the pool. From the porches you can relax and watch the little ones play at the pool. This home boasts 5 bedrooms and 4 bathrooms. There are 3 master suites in this home. Covered entry with patio chairs and a private grill. Dining room with seating for 8. Master Suite #1 has a private porch overlooking the pool with very elegant seating. King bed, Sofa sleeper and wet bar. Master bath is super spacious with a Jacuzzi tub, tiled shower, split vanities and a huge walk in closet. Large Living room with a porch overlooking the Pool. Great seating. Bedroom #5 has a Full Over Full Bunk Bed and Plasma TV. This is elegant, yet comfortable living. Upon arrival our guests are welcomed with several gifts. Our managers like to spoil you. Destin Comforts is local and can take care of any of your needs 24/7. The Villages of Crystal Beach is located centrally in Destin and has 2 entrances. The rear entrance leads you down the road just 2 short blocks to the beach where there are a number of public beach accesses. Walk the 5 minutes or take the seasonal trolly. From the north entrance just within one block there is a ton of shopping, restaurants and entertainment. Coming soon is a Dolly Parton production that features an interactive pirate dinner show, and Margaritaville is almost complete down at the Harbor. 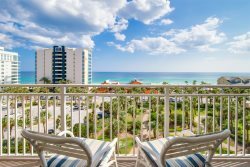 Destin has so much to offer ~ Pristine beaches with powder white sand and Emerald Green waters, Water sports, Fishing, boating, Numerous golf courses, water park, Nightlife and so much more. Destin is commonly known as the Luckiest Fishing Village in the World! Be sure to check out our local attractions page on Destin Comforts website for suggestions on fun things to do and local area discounts for our guests. What are you waiting for? Get busy planning your Unforgettable Destin Vacation at Crystal Palms! Courtney and everyone I spoke to was overly accommodating! Had I not found Destin Comforts.. our Spring Break would not have happened!! Will definitely book with them next time! Payments made by check must be CERTIFIED FUNDS ONLY ~ MONEY ORDER OR CERTIFIED BANK CHECK and all final payments are due 60 days prior to check in. No refunds on cancellations within 60 days of arrival.